Innostack is happy to announce the event Innotalk on Legal Archives - An Insight for CEOs which will be held on 11th October in Thapasya Building, Kochi. 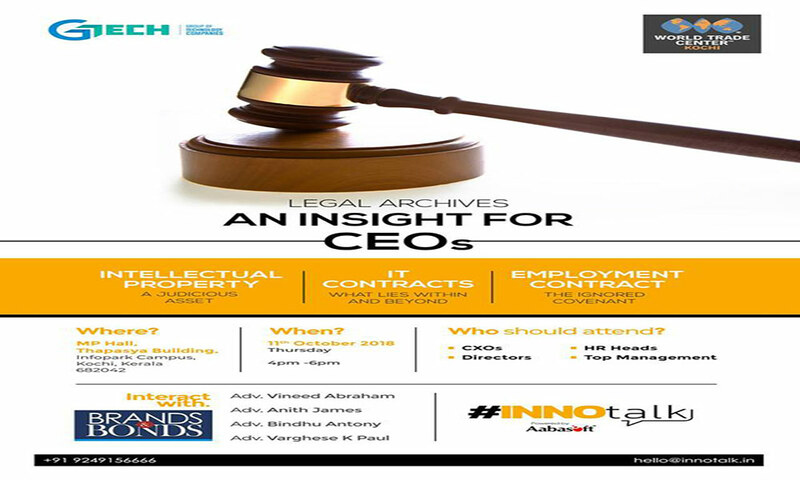 Innostack is happy to invite you to an interactive discussion named Innotalk on the topic, Legal Archives –An insight for CEOs. The interactive session on legal topics which is especially focused on the IT industry. This session will help you in understanding legal areas which are not usually deliberated and its prime focus is for CXOs. 1. Intellectual Property – As an investment tool - How IP help the company to attract investment. 2. Legal implications of various types of IT Contracts like Fixed Fee Model, T&M, SAAS models, T & C etc. 3. Importance of Confidentiality/Non Disclosure/ Non-solicitation. 5. Things you should know before the termination of an employee. The CEOs, CXOs, Directors, HR Heads and Top management. Be a part of the event on 11th October in Thapasya, Kochi.